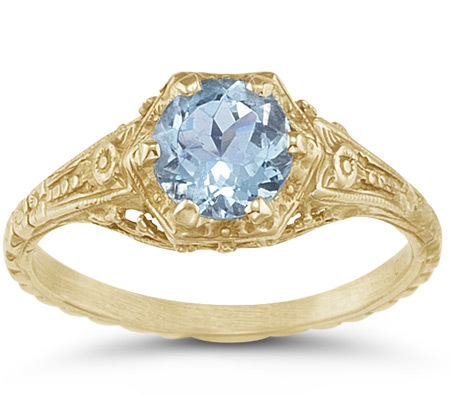 Apples of Gold Jewelry brings you another fantastic antique style ring with this antique-style Victorian-era floral aquamarine ring in 14K yellow gold. The glacial blue of the authentic and sparkling round-cut aquamarine stone will capture the light and your heart when combined with the 14K yellow gold ring, which is designed with a creative floral design. The gemstone, which is 6mm and A rated, is a beautiful addition to a ring with plenty of history - while the materials are new, the ring is modeled after the original design from the 1800s. We guarantee our Antique-Style Victorian-Era Floral Aquamarine Ring in 14K Yellow Gold to be high quality, authentic jewelry, as described above.